Here comes the bride – and she’s trying not to break the wedding budget. She and her fiancé get married on a Friday evening or a Sunday instead of Saturday afternoon. Perhaps they print their own invitations and wedding photos, or go with a buffet and heavy paper plates instead of a sit-down meal and fine china. Keeping costs down doesn’t mean you have to settle for anything less than a classy ceremony and reception. But that planning can be painstaking and time-consuming, said Kristin Beauchamp, who was married in May 2007 at the Basilica of the National Shrine of the Assumption of the Blessed Virgin Mary in Baltimore. 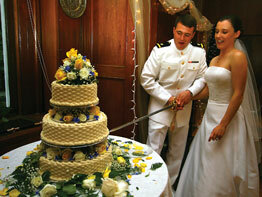 She planned her own wedding and reception through much of her 18-month engagement to her husband, Robert, a Naval ensign training to become a flight officer in Pensacola, Fla.
“If I hadn’t shopped around, I easily could have paid two or three times what I did,” said Mrs. Beauchamp, a marketing specialist who grew up in Howard County as a parishioner at St. Michael, Poplar Springs. Her ceremony and reception cost about $12,000. By comparison, a 150-person wedding averages $25,000 or more in urban areas, according to www.TheKnot.com, a wedding Web site. In addition to comparison shopping, couples should avoid emotional choices, and seek ways to cut costs where nobody will notice, perhaps making your own table centerpieces and bouquets.